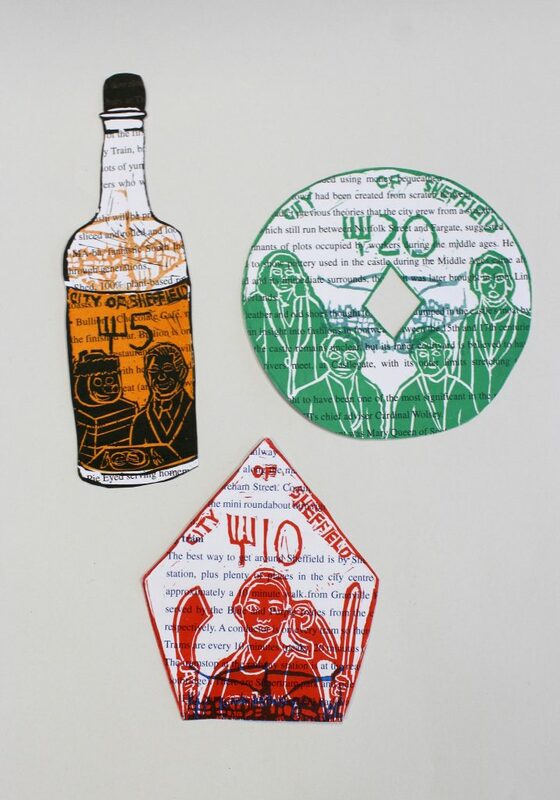 This is the fourth in our series of posts based on the current exhibition in the Library Gallery, and the project by Edinburgh College of Art Illustration students, based on the album of Notgeld, emergency money, from the early 1920s. The original German Notgeld was produced for local use, which was frequently reflected in the design. 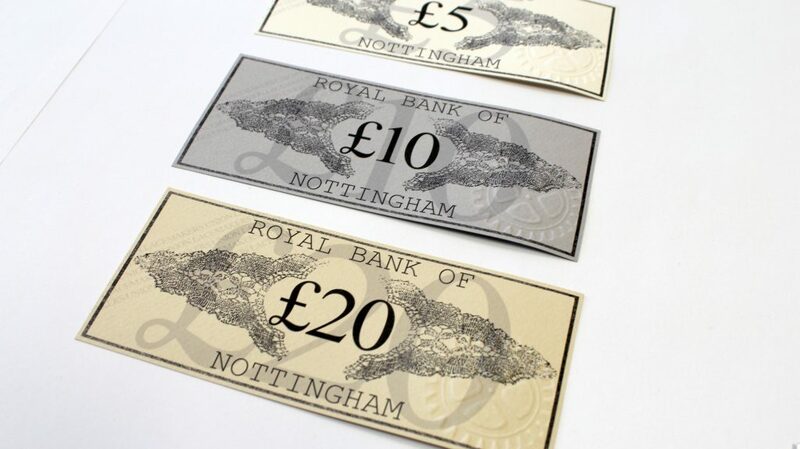 In an earlier post we looked at student Notgeld which was inspired by landscape and heritage. 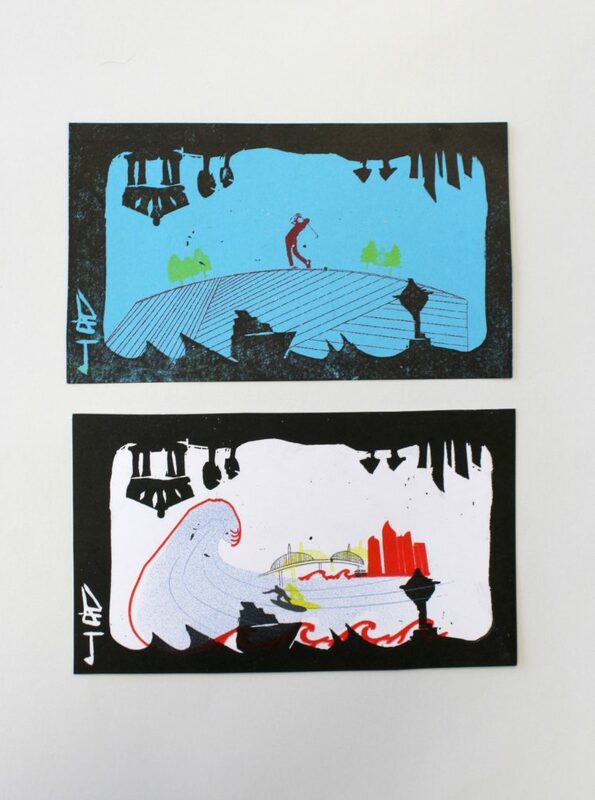 In this post we feature the work of the students who celebrated local industry and popular culture, often humourously. The Goffr is Sheffield. The notes show different cultural aspects of the city. For example, one of my notes uses the colours red and blue to symbolise Sheffield’s two football teams. The note is a pentagon to reflect the shape of the team badge. One of my other notes is shaped like a Henderson’s Relish bottle, which is a sauce made in Sheffield. My final note is shaped like the Peak District logo. 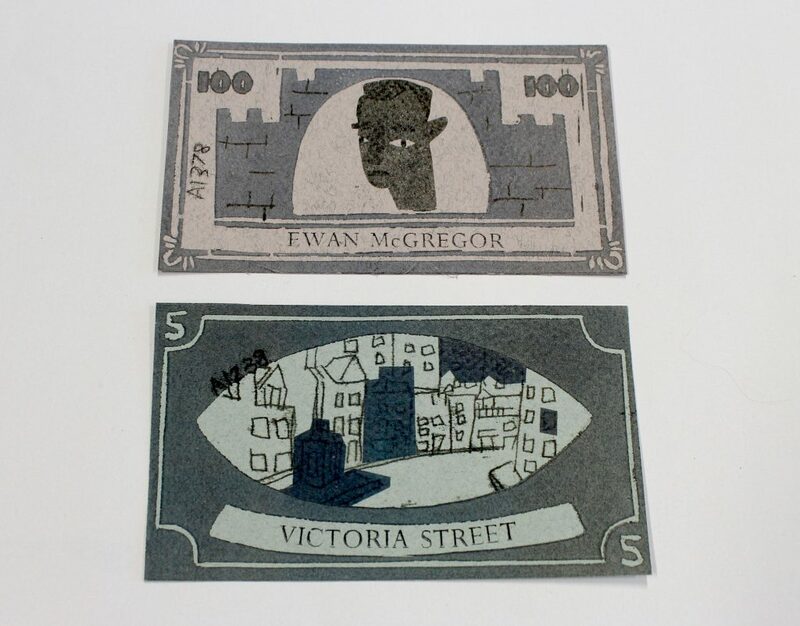 The currency I made for the city also expresses an important part of the city’s history. It is inspired by the shape of a fork which symbolises Sheffield’s stainless steel industry. Bank notes usually have prominent figures featured on them so I included some well-known celebrities who are from Sheffield. I chose Sean Bean, Jessica Ennis-Hill and the Arctic Monkeys. I chose to explore the history of the lace industry in Nottingham looking at the importance of its role within the economy. I based my Notgeld on Leith, an industrial area with a lot of history and culture. 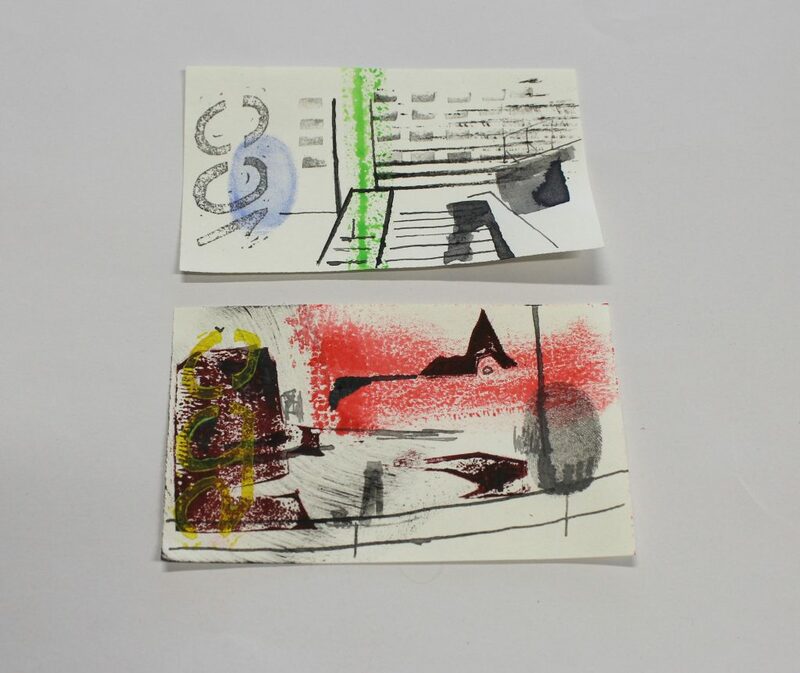 Inspired by the variety of styles, colours and collectable nature of the University’s collection, I decided to create more abstract, palm sized notes. Using print and mixed media I explored the texture, sound and energy of the area that I call home. My work is about my favourite activities to do in Busan, South Korea, which is my hometown. I have invented this special currency that can be used to pay for sports. Notgeld for Busan, South Korea. Young Lee. My Notgeld notes are an example of what the currency may be like if Scotland gained independence. I took a more humorous approach when exploring themes of architecture, royalty and famous Scottish figures whilst using a strict colour palette of blue, white and black. Currency for an independent Scotland. The exhibition includes a few items which are unexpectedly humourous, for a University Library. 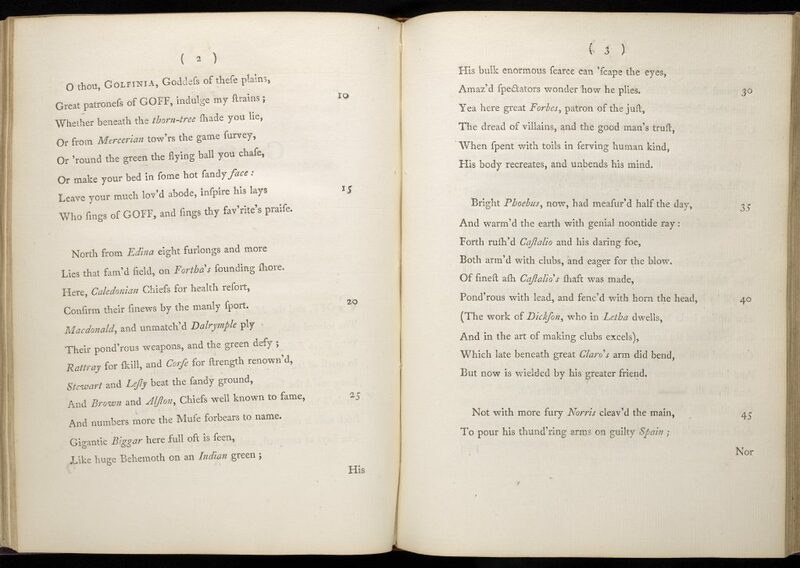 The one which perhaps best complements this group of student Notgeld is the humourous poem about golf The Goff. This, incidentally, like Gee Watson’s Notgeld, is set in Leith. It records, in mock-heroic verse, a match between a young Edinburgh lawyer and a bookseller, on Leith Links. In the passage reproduced below they see a group of senior players – the great and the good of Edinburgh – described as if they were the heroes of legend. We are not sure whether ‘Golfina’, the goddess of golf, is present in modern Leith. This entry was posted in 20th Century, Rare Books, Uncategorized and tagged abstract, Arctic Monkeys, book illustration, Busan, Edinburgh, Edinburgh College of Art, fork, Goff, Golf, Illustration, Jessica Ennis-Hill, Korea, lace, Leith, Notgeld, Nottingham, Scottish independence, Sean Bean, Sheffield, special collections by elawrence. Bookmark the permalink.